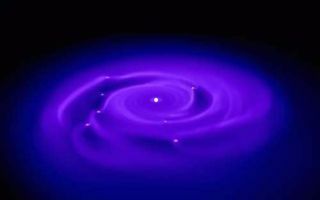 Shock waves around dusty, young stars might be creating the raw materials for planets, scientists now say. NASA's Spitzer Space Telescope detected quartz-like crystals around young stars just beginning to form planets, about 400 light-years away. The crystals, called cristobalite and tridymite, are known to reside in comets, in volcanic lava flows on Earth, and in some meteorites that land on Earth. Astronomers already knew that crystallized dust grains stick together to form larger particles, which later lump together to form planets. But they were surprised to find cristobalite and tridymite crystals, because they require flash-heating events, such as shock waves, to form. The findings suggest that the same kinds of shock waves that cause sonic booms from speeding jet planes are responsible for creating the stuff of planets throughout the universe. "By studying these other star systems, we can learn about the very beginnings of our own planets 4.6 billion years ago," said William Forrest of the University of Rochester in New York. "Spitzer has given us a better idea of how the raw materials of planets are produced very early on." Forrest and University of Rochester graduate student Ben Sargent led the research, which will be detailed in the Astrophysical Journal. Planets are born out of swirling pancake-like disks of dust and gas that surround young stars. They start out as mere grains of dust swimming around in a disk of gas and dust, before lumping together to form full-fledged planets, according to the leading theory. During the early stages of planet development, the dust grains crystallize and adhere together, while the disk itself starts to settle and flatten. This is thought to occur in the first millions of years of a star's life. Quartz and its mineral relations, such as cristobalite and tridymite, are forms of silica, which is made of only silicon and oxygen and is the main ingredient in glass. When melted and crystallized, silica can form the large hexagonal quartz crystals often sold as mystical tokens. When heated to even higher temperatures, it can also form small crystals like those commonly found around volcanoes. It is these high-temperature forms of silica crystals, specifically cristobalite and tridymite, that Forrest's team found in planet-forming disks around other stars for the first time. "Cristobalite and tridymite are essentially high-temperature forms of quartz," Sargent said. "If you heat quartz crystals, you'll get these compounds." In fact, the crystals require temperatures as high as 1,220 Kelvin (about 1,740 degrees Fahrenheit) to form. But young planet-forming disks are only about 100 to 1,000 Kelvin (about minus 280 degrees Fahrenheit to 1,340 Fahrenheit) — too cold to make the crystals. Because the crystals require heating followed by rapid cooling to form, astronomers theorized that shock waves could be the cause. Shock waves, or supersonic waves of pressure, are thought to be created in planet-forming disks when clouds of gas swirling around at high speeds collide. Some theorists think that shock waves might also accompany the formation of giant planets. The findings are in agreement with local evidence from our own solar system. Spherical pebbles, called chondrules, found in ancient meteorites that fell to Earth are also thought to have been crystallized by shock waves in our solar system's young planet-forming disk.